Not in the coaching/consulting industry? See other use cases. In the coaching/consulting business, client retention can be a major sticking point. Acquiring clients is a challenge in itself, but retaining them over the long term can be even more difficult. Studies show that fewer than 50% of coaching clients stay with their coach for 2 months, and even fewer stay on for 3 months or more. What’s needed is a flexible, automated solution for recurring billing, so you can make it easy for your clients to stick with you. For many entrepreneurs, running a coaching or consulting business is a dream come true. The ability to make an income sharing your expertise with others is a true blessing, and the top coaches can make a great income doing it. But attracting and retaining coaching clients can be a challenge. …But when your client’s aren’t staying with you long-term, just bringing in revenue can be a major hurdle. The problem is compounded by the fact that some clients are slow to pay come invoice time, resulting in time being eaten up chasing payments. What you need is ability to sign up your clients on a retainer and charge automatically every billing cycle, so they stay with you longer and generate more long-term revenue. With ChargeOver, you can establish and automate recurring payment plans effortlessly. ChargeOver is an automated billing and payments app that runs in your web browser. With ChargeOver, you can create any type of payment plan—recurring flat rates, metered billing, installment plans, limited billing cycles, and more. This gives you the ability to diversify your practice and offer your clients the services that meet their needs. Recurring coaching services, paid for monthly. One-off coaching services, including reports, phone sessions and audits. Installment plans for long-term coaching projects with set milestones. To setup a recurring plan, all you need to do is add a client account, select a payment plan type, and specify terms (such as cost, taxes, payment schedule, etc). From that point, ChargeOver automates the invoicing process, so you never have to worry about missing a payment. All financial data is downloaded to your accounting software, saving the time you’d normally spend creating invoices and updating spreadsheets. 1. Generate and retain new business. ChargeOver provides the resources you need to improve client acquisition, with flexible billing options that make it easier for clients to invest in and continue using your services. Options include recurring flat rates, metered billing, installment plans, limited billing cycles, and more. 2. Get paid faster, without chasing after payments. ChargeOver automates the invoicing process, billing your clients at the end of every month (or any other payment schedule you choose). You never have to worry about missing a payment. 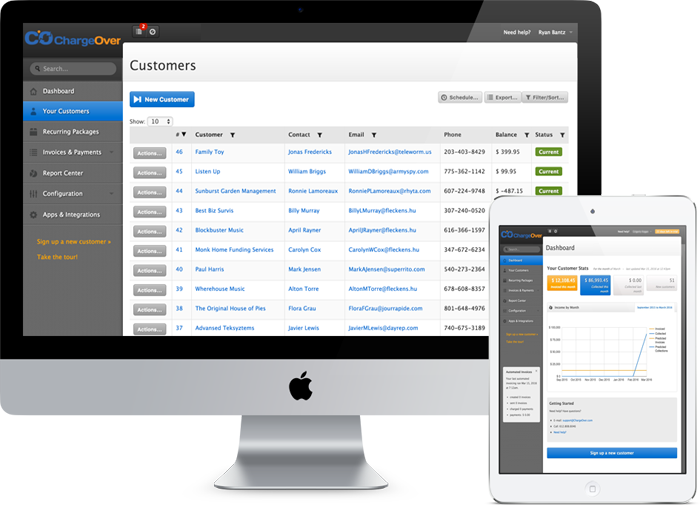 ChargeOver is compatible with QuickBooks, Xero, and other common accounting apps. The second an invoice is paid, ChargeOver syncs all data with your accounting software. 4. Build a stable, recurring revenue stream. ChargeOver lets you establish recurring monthly revenue, with both retainer arrangements (monthly fees) and per-project billing. This increases your revenue over the long term by ensuring that each client stays with you and continues generating income. It’s easy to get started with ChargeOver. Running a coaching or consulting practice is a busy lifestyle, so we made it super easy to get started with ChargeOver. You do not have to sign any contracts or fill out any forms. Simply create your ChargeOver account, and start using it in seconds. Also, your first 14 days with ChargeOver are free, so you can test-drive its great features and see what they can do before you pay anything.